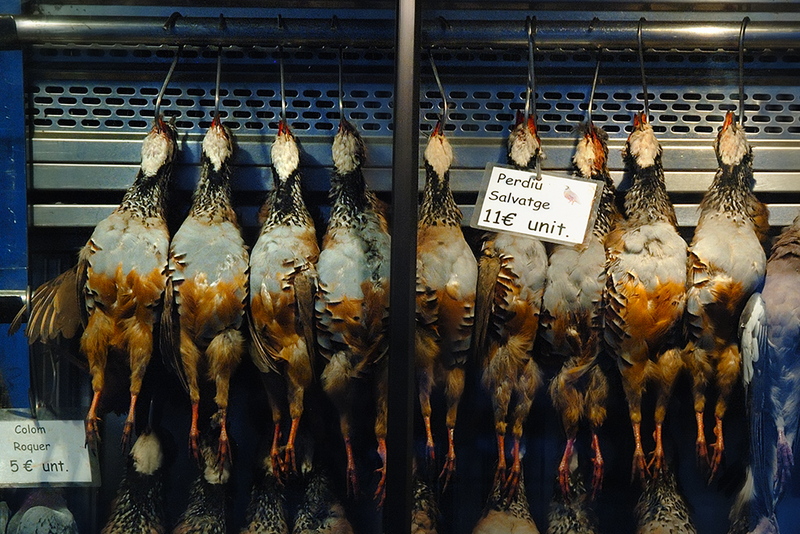 Like a painting depicting hunting trophies or a still life portraying dead animals, specially those of hares and birds, appeared before my eyes, imbued with a ghostly bluish-yellowish light, the wild game stand in La Boqueria market. From the mixture of species on display, I cropped this rack of wild partridges so you could take a good peek at the strange artistic beauty that inspired painters in the past, at that mysterious blend of nature, food, life and death evoked with traditional austerity in many Spanish bodegones where dead animals hung from a hook waiting to be skinned and free of any banquet luxury or adornment so often present in similar paintings from other countries in Baroque times. I know this is just a picture of dead wild partridges and you may not find it artistic at all but I wanted you to think about this aspect of painting and the peculiar relationship between art, men and dead animals regarded as something aesthetic. What a great photo. Beautiful image. Unique, and not something I have seen before on CDP. You bring up a good point. Making art from life requires imagination, and these birds REALLY are beautiful; probably I'd prefer them alive, however. Our family recently are considering many aspects of human consumption of animals, medical and ethical -- difficult conundrum at best. Don't read _Eating Animals_ if you're not interested! Pffft ça me donne FAIM ! A primeira impressão é de muita selvageria. A maneira como foram abatidas e estão penduradas. A luz, a cor estão muita bacanas. Mas o sentimento de dor e dó desses animais é mais forte do que a estética. This picture is a work of art and is beautifully shot. Although I don't always have the time to post my thanks, I visit your site every day and love your photographs and reminding me what a fantastic place Barcelona is. My secretary's husband like to hunt birds. I don't think we could ever see a string of birds for sale in our local groceries here. nevr thought a dead bird could look so lovely!